Half-snake, half-woman, all monster. 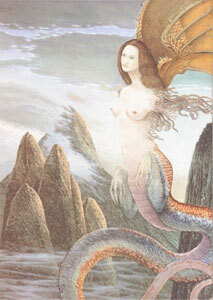 Echidna (Greek mythology) is the mother of the most famous and fearsome of Greek monsters. Married to the god/monster Typhon (Greek mythology), the two beasts bore a brood of children that only a half-serpent mother could love. Echidna is best known for being the mother of monsters. There's not a huge library of "Echidna mythology" laying around somewhere where she does a bunch of other things. She is sometimes confused with Python of Greek mythology who guards the Garden of Hesperides, though that role is actually that of her child Ladon. Ladon was an enormous draco (snake), while Echidna was only half-snake. She, like Typhon, had the bottom half of a snake (or several snakes according to which myth you read), and the torso of a human. She did have snakes for hair, a trait she passed down to her child, the Gorgon. Most people would recognize Medusa as the most famous gorgon, though she is not actually related to Echidna in any way (we'll get to that elsewhere on the site). Cerberus - the three-headed dog that guards the entrance to Hades. Chimera - Part-lion, part-goat, part-snake - all monster. Gorgon - the snake-haired and snake-bodied humanoid that was created in its mother's image. Its stare could turn a person to stone. Medusa became one of these creatures in a later myth. Hydra - the nine-headed serpent who grew two new heads for every one that was cut off. Ladon (Python) - the snake that guarded the golden apples in the Garden of the Hesperides. The Nemean Lion - the giant lion with impenetrable hide who becomes the constellation Leo. Orthros - the two-headed dog that lived with giants. The Sphinx - the half-human, half-lion that forces those its meet to answer its riddles, or die. Like many of history's mothers, Echidna's legacy is destined to be carried on by the children she left behind. She herself was thought to preside over the corruption, rotting, and pestilence of the lower dregs of the earth. Most myths have her residing in Tartarus (Greek mythology), who is both a storm-pit of the underworld and father to Typhon (don't ask). What ended up happening to Echidna is lost in myth, though we can assume that she still lives in Tartarus, keeping her husband Typhon company while he struggles beneath Mount Etna. Return from Echidna Mythology to the List of Mythical Creatures.